matter of fact, there is no evidence to indicate that he even saw a Bonsai. What is this article about then, you may ask. In my quest to understand more about the creative process and trying to better myself as a creative person, I explore a lot of different theories and principles and try to open my mind to as many influences as possible to find my own rightful place within the creative space. My chosen field is that of Bonsai creation. We all know that the roots of Bonsai are firmly established in Chinese and Japanese culture. We also know that Bonsai as a creative activity has now spread to all corners of the world and it is clear that other influences are being incorporated into the creative concepts serving as foundations for Bonsai. The recent Artisans Cup in the USA is an example of this, but there are many others spread throughout Europe. A very distinctive style is emerging out of Africa as well. Why not look at the seven Da Vincian principles as a source of inspiration or direction in relation to Bonsai design? Curiosity – An insatiably curious approach to life and an unrelenting quest for continuous learning. This principle can directly be implemented in the life of any Bonsai artist. Being curious about life in general and then also the creative process surrounding Bonsai cultivation, is very important in establishing the next steps for growth. Asking questions, exploring concepts, trying new designs on the creative side, but also being curious about the horticultural process underlying Bonsai are all part and parcel of the Bonsai artist’s grounding. I encourage artists to make notes, read often, watch videos, talk to other Bonsai artists, attend conferences and to never stop asking questions. Leonardo da Vinci’s notebooks amount to over 7000 pages. Demonstration / Independent Thinking – A commitment to test knowledge through experience, persistence and willingness to learn from mistakes. As Bonsai artists we are involved in a practical application of centuries of knowledge and techniques. The last few decades saw an explosion of information and it is our job as artists to make sense of all of this and to apply what suits your own philosophy and style to your own designs. Yes, you can copy other people, but I am convinced that real satisfaction and personal growth comes when you use all of your knowledge and skill and create something new. This can be applied in a very practical way in Bonsai as each plant is unique. Sensation – The continual refinement of the senses, especially sight, as the means to enhance experience. According to Da Vinci, experience is delivered through the senses: sight, sound, touch, taste and smell. Bonsai creation is all about using your senses, especially sight, touch and smell. The more sense you can incorporate into your interaction with your trees, the more fulfilling the experience. You learn and experience through your senses. One of the problems that I experience is that modern day living is too noisy and very visual. So much so that it leads to sensory overload. Something that I need to work on more is to refine my sensory experiences by deliberately focussing on those sensory stimuli that matters during the creative process and to block or filter the “noise” out. Smoke (Sfumato) / Embrace uncertainty – Becoming open to the unknown. A willingness to embrace ambiguity, paradox and uncertainty. In her blog, Andrea Balt mentions that we cannot “make use of our full creative potential without the ability to embrace uncertainty. An open, always questioning mind is our creativity’s best ally.” In Bonsai there are many uncertainties, especially when it comes to severe styling processes. Will a tree flourish after severe root pruning, how will it react to wiring, did I cut too much, etc.? There are many different thoughts and ideas around when things should and should not be done when it comes to repotting, lifting yamadori, using chemicals, etc. Embrace the unknown. Art and Science – Whole-brain thinking. The development of the balance between science and art, logic and imagination. Your brain operates as a whole organ. Society has been telling us for a long time that one half is more dominant than the other. As an artist you are using both halves. You are programmed to be creative, it is just a case of exploring and finding your creative roots. The capacity is already there. This principle can also relate to the two parts of Bonsai creation. There is the creative / art side and then there is the science / horticulture side. Both are equally important. Embrace both. It could be that one of these attracted you more to Bonsai than the other. 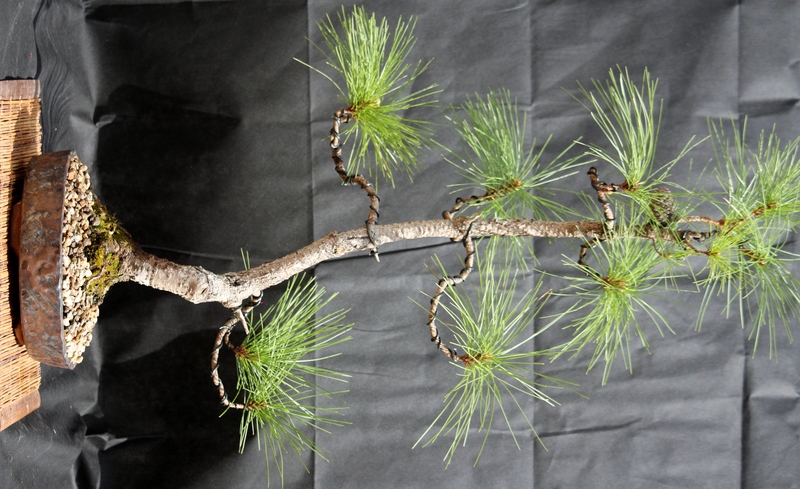 It is your task as a creative Bonsai artist to get yourself up to speed with both aspects. A beautifully created dead Bonsai is as unappealing as an ugly, living Bonsai. Study the art of science and study the science of art. Da Vinci was ambidextrous, something you can try to help with the development of the motor functions of both halves of your brain. The body (mind-body care) – The cultivation of grace, ambidexterity, fitness and poise. Balancing the body and mind. This one is self-explanatory. A healthy body is needed to dig trees, cultivate the trees, carry them around, etc. There is more to it than just being fit enough to do what you have to do around your trees. There is also the healthy body – healthy mind concept that is so important in the creative process. This principle was taken very seriously by Da Vinci in his day-t-day life. Mild exercise and good nutrition with ample rest serve as foundations for what is needed. Connection – A recognition of and appreciation for the interconnectedness of all things and phenomena. Systems thinking. Da Vinci said: “Learn how to see. Realize that everything connects to everything else.” The growing medium that you plant your Bonsai in, the aesthetic effect of pot and tree, the light that all leaves get, the link between water and nutrition, your interaction with the tree, everything is connected. You are connected to the tree and everything the tree is connected to. For you to be a better Bonsai artist and based on the Da Vinci principles, in summary: Be curious and never stop learning. Test yourself and be independent in a practical way. Use all of your senses when interaction with your creativity. Embrace the unknown and explore. Use your logical and creative powers. Look after yourself and realise that everything in life is connected.